My honest reaction to Bambi? I was bored. Perhaps a film of its reputation is bound to fail. After all, it is remembered as a very powerful, emotional experience, but I was completely unmoved by the entire film. Its most famous scene, which I need not mention, lacks poignancy because the story gives us absolutely no moments of true love and affection between Bambi and his Mother. Their relationship is more symbolic in nature. These are archetypes for human families in the 1940s. Trouble is Bambi ends up learning more about everything from all the other animals in the forest. The only useful bit of information his Mother tells him is to beware of the meadow. Practical advice obviously but all his Mother has taught him is how to be afraid. And that is perhaps the problem with the film in general: the parent-child relationship is so stoic and repressed that I think the film might actually scare young kids today for a new unintended set of reasons. It is a document of the times in which it was made. Bambi’s Father, The Great Prince of the Forest, is silent and physically distant. He watches from afar, unemotional, robotic, as Bambi’s Mother is left to raise him. When the Mother dies, the Father takes over and still lacks humility. 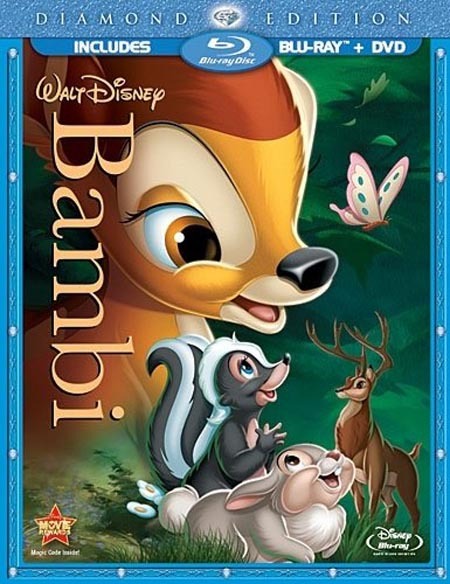 To further my point, Bambi II was not a sequel but rather an “in-between” film detailing how the Father raised Bambi, as if the studio realized this vital moment in the understanding of the story needed to be addressed, even if 60 years later. Thumper the baby rabbit who befriends the young Bambi stops in mid sentence when his mother threatens him with reminders of things his father has said. I’m all for discipline, but scaring your children into submission is really a way to compensate for lazy parenting. This alien way of raising children belongs to another generation, for better or worse, and because the film preserves this tradition in its fibers Bambi lacks humanity. The characters are more like caricatures. They feel as if they had been designed to be cute, right down to the voice acting. While it’s refreshing to be able to identify children’s’ voices while watching characters who are themselves children, the performances aren’t very good. Thumper is annoying. The supporting cast isn’t impressive. In Snow White and the Seven Dwarfs you could really lose yourself in all the miscellaneous forest creatures scurrying at the bottom of the frame. They had personalities. The only character with a pleasing personality is the young Bambi who accompanies us through the first part of the picture. I cared about him despite the hokey way he is brought into this world. It comes down to the writing. The novel of Bambi could have been terrific material for a feature length animated film. The approach here, the Disnification of the material, doesn’t work. I am not a hip, anti-Disney kid rebelling against the wholesomeness of Disney’s great past. Snow White and the Seven Dwarfs is one of the best films of the 1930’s, and certainly contains the best animation I have ever seen. Pinocchio is an even better film; a darker film that I believe is too intense for wee little ones. Bambi is just not a very good film, and compared to other films in the Disney canon it really suffers. There is one cute moment in the entire film: when Bambi learns to talk. He tries to say, “Bird” but it sounds more like, “Bir.” Thumper instructs him to say, “Bir-da, bir-da!” With a great deal of effort, Bambi shouts, “Birda”—the only moment of humanity and growth in the entire picture. Part of the reason this scene works so well is the animation. The animals in the forest, especially Bambi, look as if they have bones and blood under their fur. As their appendages move, the lines of their muscles move accordingly and are consistent frame to frame. That’s the thing—the fluidity of the animation. It is quite spectacular. Today’s hand-drawn (or 2-D as regrettably most hand drawn stuff is now done on computers) animation would not put up the budget to capture these small but vital details. But what is a Disney film without landmark animation? Bambi is classic Disney in this regard. The forest fire in the end and the rain that brings a new season really show off some elemental powers from the animators. The film is beautiful to look at but boy is that all it is. I think it’s time for modern movie buffs to reexamine the classics or at least for people to actually watch these films and develop their personal opinions. I think The Godfather is up for reevaluation, and so is Walt Disney’s beloved 5th feature. I found no pleasure in it and felt a great deal of repression and even hostility in its dated depictions of family life. 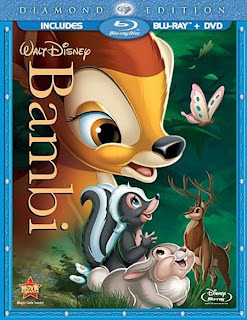 The question has always been at what age parents should show Bambi to their children. I think the question should be whether Bambi is important viewing for modern families.